Driving a commercial semi-truck is physically demanding work, and it's fairly common for truckers to suffer painful injuries that force them to stay off the road while recovering. When an injury keeps you out of your rig and on your sofa, you may file a claim for Ohio workers’ compensation. Back Pain or Carpal Tunnel Syndrome? You're Not Alone! It’s been my experience that many truckers work with pain for years and don’t seek medical treatment or report the problem to their employers until they just can’t climb into the driver’s seat anymore. 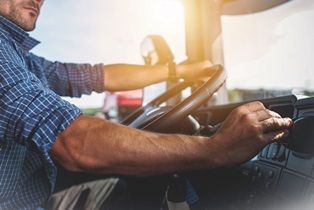 A survey conducted by the National Institute for Occupational Safety and Health (NIOSH) published in 2014 found that 68 percent of long-haul truckers who took days off work to recover from non-crash related injuries didn't report them to their employers. Strains and sprains. About 50 percent of all truck driver injuries are muscle, tendon, and ligament strains and sprains. Lifting loads and gear, coupling trailers, and sitting for long periods can cause back and joint injuries that can become debilitating. Bruises. Falls while walking to, from, or around a truck aren't uncommon in poor weather, and can cause bruising and even more severe internal damage. Fractures. Being struck by an object, falling, or crashing can cause fractures and concussions. Cuts and lacerations. As a trucker inspects and maintains his rig, he may sustain an injury like a cut that requires stitches or other treatment. Soreness and pain. Overuse and overexertion injuries can lead to muscle soreness and chronic pain. Multiple traumatic injuries. According to NIOSH, 70 percent of fatal truck accidents are caused by the careless actions of other drivers. While occupants of cars are more likely to be killed in these collisions, truck drivers can suffer traumatic injuries in these collisions. If you experienced one injury—or several—you might be entitled to Ohio workers’ compensation, but you have to report your injury and file a claim. Why Don’t Truckers Report Their Injuries? I’m not surprised to hear that truck drivers rarely report injuries to their employers. All too often, employees are made to feel like frauds when they report an injury and ask about workers’ comp. If you need to take time off to recover from an injury and aren't getting the help you need from your employer, the Ohio Bureau of Workers’ Compensation, or your Third Party Administrator, call me to get answers. What Should I Tell My Workers' Comp Doctor?